Herpes Virus Life Cycle. This image is 500 pixels across, the original is 4,000 x 5,335 pixels. 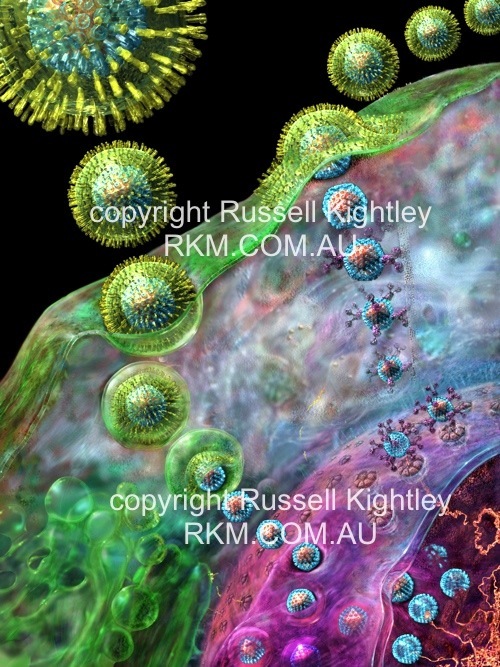 EXPLANATION OF HERPES VIRUS REPLICATION IMAGE: At upper right a virus particle lands on a cell and docks with cell surface proteins. The viral envelope then fuses with the plasma membrane of the cell and the viral capsid (blue) containg the viral genome (red) and tegument proteins enter the cytoplasm. The capsid then travels along a microtubule towards the nucleus where it docks with a nuclear pore (flower like structure embedded in the purple nuclear envelope). The viral DNA enters the nucleus through the pore and circularises before replication. New viral capsids assemble in the nucleus and daughter genomes are taken into them (bottom right). The capsids bud through the inner nuclear envelope gaining a temporary envelope that surrounds them during their (short) stay in the perinuclear space. This envelope then fuses with the outer nuclear envelope and the now naked capsids progress through the cytoplasm until they bud into Golgi vesicles laden with viral proteins. This budding into the vesicle furnishes the developing virion with tegument proteins, an envelope and surface projections. The vesicle delivers the contained virion to the cell surface. The vesicle fuses with the plasma membrane and the new virus particle is free to infect another cell.